I’m pretty gaga for guacamole. What’s not to love? Creamy, fresh, satisfying, vibrant, and with a number of ways to enjoy it – raw by the spoonful, or heck, by the fingerfull, globbed on a vegan burrito (Chipotle, anyone? ), or one of my favorites… Guacamole and Toast, anyone? I’ve been upping the nutrient density of my guacamole though. Enter: organic broccoli. Do you remember not too long ago, when I used my trick of stealthily sneaking organic raw broccoli into a meal that I wrote about here? Broccoli is tres importante for adding tons of cancer fighting power to your life so it makes a very regular appearance in our lives. Let me tell ya… there was not a hint of raw broccoli flavor in this new guacamole dish (of course, you can’t go wrong when you add some sweetness like mango or apple). So, here’s another recipe, loaded with nutrition to keep my family uber healthy, that I’ll go back to time and again: Mango Love Guacamole. Sneaking Broccoli Into Your Food – This is Easy! I have a real love for cucumbers… They’re such a great summer time snack. I put them in salads, smoothies, juices, and they’re especially fun as boats for carrying yummy fixin’s like mashed up avocado. 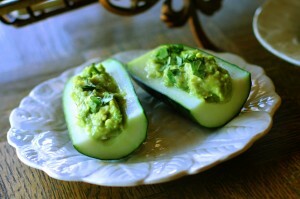 Previously, I shared my Avocado Cucumber Smish Smash recipe here… still one of my favorites. Here’s another great one I’ve been making the past couple of weeks. It’s simple, takes about 5 minutes, and uses minimal ingredients. After you have your cucumber in quarters, like boats, scrape the seeds into a medium size bowl. Add the avocado, lime, salt, and onion powder. Mash up the contents. Fill the boats with the avocado mixture. Top with fresh basil, if desired. That’s it! Enjoy!